The church of the Holy Sepulchre or Round Church was originally built around 1130 by the fraternity of the Holy Sepulchre. It became a parish church in the 13th century and several changes to the structure were made. A gothic bell-storey was built in the 15th century and the original windows were replaced. These elements were removed during a restoration by Anthony Salvin in the 19th century and the upper storey is an interpretation of how the original church may have looked. It is one of five surviving medieval round churches in England, most of which are associated with the Knights Templar and Hospitaller. The main gate of Queens' college was built in 1448-49 and is considered the oldest of its kind in Cambridge. King Edward's Tower at Trinity College from 1426 has been moved and altered while only the ground floor of the gatehouse at King's college was built in 1441, the rest was completed in the 19th century. 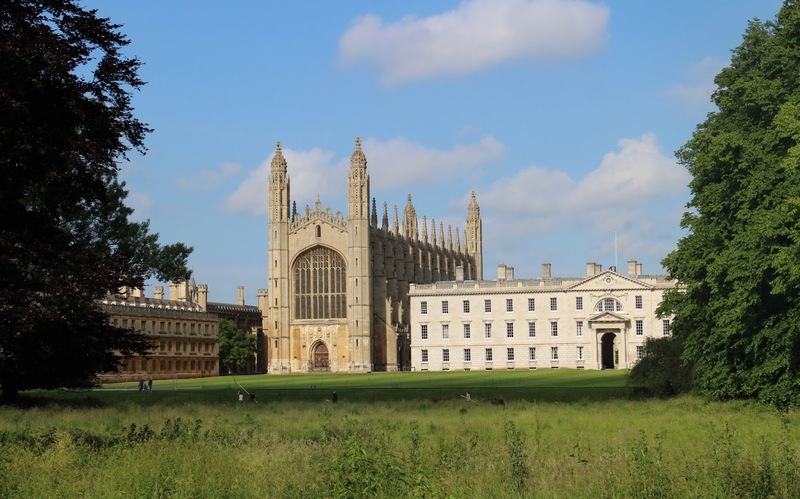 It has been suggested that the architect of Queen's college was Reginald Ely. A second court was created in the second half of the century, while later buildings were added over the succeeding centuries. The college spans the river via the famous mathematical bridge. The King's College Chapel was built in stages between 1446 to 1515, though the stained glass was only completed in 1531 and the rood screen, considered one of the earliest examples of renaissance design in England, was finished in 1536. The architect is unknown but possible suggestions include Reginald Ely or Nicholas Close. The stone vault (1512-1515), which replaced a timber roof, is by master mason John Wastell. The Gate of Honour at Gonville and Caius College is one of three gates built by John Caius after he refounded the 14th century Gonville Hall in 1565. The gates of Humility and Virtue were completed within Caius' lifetime, while the Gate of Honour was finished in the two years following his death in 1573. The design is in part attributed to Caius himself, though it is known that he hired an architect by the name Theodore Haveus or De Have. The great gate of St John's College was completed in 1516 and is thought to be the design of William Swayne, a master mason who had been employed at King's College chapel. A second and similar gate tower was built in 1599-1602 between the second and third courts of the college. At the back can be seen the chapel of St John's college, which replaced a 13th century chapel in 1866-69. It has the tallest tower in Cambridge and was designed by architect George Gilbert Scott. The chapel of Trinity College is also partially visible on the left, built in 1555-67. Opposite the great gate stands the Divinity School from 1879 by Basil Champneys, embellished in the 1890s. The chapel of Pembroke college is thought to be the first building designed by Christopher Wren, was commissioned by his bishop uncle Matthew Wren and built in 1663-65. It is the earliest building in Cambridge without any gothic details and is roughly contemporary with Wren's Sheldonian Theatre in Oxford. The shape and size of the chapel seems to draw inspiration from Inigo Jones' chapel at St. James' Palace while the windows are similar to Jones' design for the later demolished chapel at Somerset House. Wren's chapel was extended by George Gilbert Scott in 1878. The building on the right was built in 1875-77 as one of the Red Buildings designed by Alfred Waterhouse. One the opposite side stands the west range of the original court, built in the 14th century and featuring the oldest gatehouse in Cambridge. Wren's second chapel at Cambridge was built in 1677 for Emmanuel College. 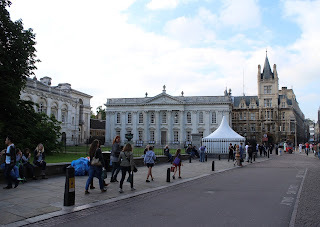 The college had been founded in 1584 on the site of a Dominican friary, which already included a chapel though it was the friars' dining hall that was initially used. The dining hall turned chapel became a library after 1677 and remained as such until 1930. The other buildings around the front court have changed significantly since the completion of the chapel. The north range (left) is part of the founder's building from 1584-89 but was heavily remodelled in 1760-64 and the oriel window is from 1876, added by architect Arthur Blomfield. The south range was rebuilt as the Westmoreland Building in 1719-22. The Wren Library was built in 1676-95 according to a design by Christopher Wren for Trinity College. The library forms the west range of Neville's court, which had been completed in 1612. The gate of the wall that previously closed off the courtyard to the river now stands as the college entrance from Trinity Lane. The north and south sides of the existing courtyard were extended to reach the new library building. The original gables of the these older buildings were removed during a rebuilding and remodelling of Neville's Court in the 18th century. Senate House was built in 1722-30, supposedly to a design by James Gibbs, though the result is not typical of the architect and may have been based on a concept by James Burrough. The intention was to build an open quadrangle consisting of three wings, though only one was actually built. 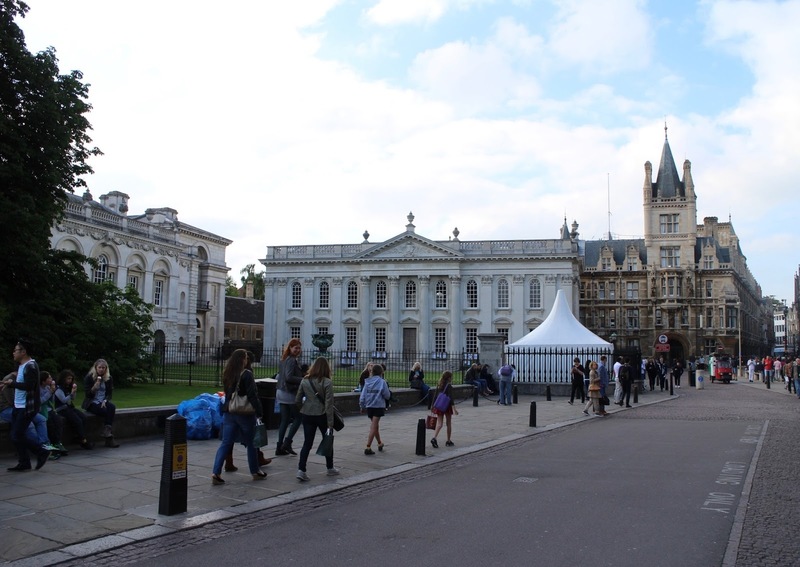 The towered building on the right is the Waterhouse Building of Gonville and Caius College from 1870, which was built as part of the modernisation of the Tree Court and has been named after the architect Alfred Waterhouse. The Gibbs Building of King's College was completed in 1729 and is named after its architect, James Gibbs. It is one of three wings, which were intended to form a closed courtyard with King's College Chapel. The other two wings designed by Gibbs were not completed due to a lack of funds and the project was not continued until 1828 when Front Court was completed by William Wilkins in neo-gothic style. Trinity's College's New Court was completed in 1825 to a neo-gothic design by William Wilkins. The additional court is located to the south of Neville's Court and was built to accommodate the increasing rate of incoming students. The Bridge of Sighs was built in 1831 to a design by architect Henry Hutchinson, connecting the 17th-century Third Court to the 19th-century New Court, both of which belong to St John's College. Despite the name, there is no resemblance to the Bridge of Sighs in Venice, unlike the namesake in Oxford which at least looks Venetian in inspiration. Hutchinson also co-designed New Court (1826-31) with Thomas Rickman. The design for the Fitzwilliam Museum was chosen in an open competition won by George Basevi in 1835. Work began two years later and continued after the architect's death by Charles Robert Cockerell in 1845-63. Funds ran out and the project came to a standstill but was finally completed by Edward Barry in 1870-75. Both succeeding architects mostly kept to Basevi's basic design. An extension was added in 1931. The buildings at the north corners of the Downing College quadrangle were built in 1929-32 by architect Herbert Baker. The design is similar to the west and east ranges, which were built by William Wilkins in 1807-11 and 1818-21, though the east range was only fully completed in 1876 by E. M. Barry. The style was continued with the completion of the northern range between Baker's corner-buildings in 1950-53. Additional buildings, still in classical design, were built in 1987-93 by Quinlan Terry.